We visited the Manor Farm Great Barn in Ruislip again last Saturday to install this overhead canopy of fairy lights suspended between the pillars. Installation times are often tight at the Great Barn so we installed this canopy of crossed strands in double-quick time! 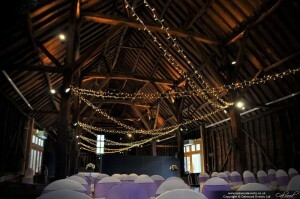 Other options include a festoon light canopy, running fairy lights along the sides of the barn, winding the vertical pillars and uplighting the walls and ceiling. See our main Great Barn lighting page for more ideas, or feel free to contact us to discuss lighting your wedding or event in the Great Barn. The Barn looked beautiful due to the lights on Saturday! Thank you for all your help.